In an interesting diversion from our usual interviews with startup entrepreneurs and investors, we had the chance to sit down earlier with Republican Presidential Candidate Gary Johnson, the former Governor of New Mexico, to talk about his online town hall with Los Angeles-based Yowie later today (at 5pm PST). Johnson spoke to us about his online outreach efforts, and how he's hoping those efforts will bring some visibility to his campaign. Thanks for taking time to speak to us today. How did this online town hall come about? Gary Johnson: Jay Snider, the founder of Yowie, offered up the opportunity, and I made contact with him and his sister Selena, who have been very supportive of my campaign. They just offered it up, and I thought it would be a great opportunity. Has online been a big part of your outreach plans, and have these been something you have been planning to do as part of your campaign? Gary Johnson: I did. I thought this campaign was going to be different than anything before, just because how technology has advanced. This certainly has been one of those changes. How important is this in getting your message heard--particularly given your difficulty getting a part of the Republican televised debates? Gary Johnson: You could say that it's my only method of communication. By that, I mean over the Internet. However, it's amazing, if you look at the fact that I'm being out-spent and out-fundraised by 100 to one say compared with Romney or Perry, I'd say for the dollars we've spent we're in a pretty good position. Can running an Internet-only campaign get your message out above traditional TV coverage? Gary Johnson: Politics is about momentum, and exceeding expectations. The Internet is in no way a traditional audience, but part of politics is about your base, about building a base, so that if the day ever comes when the spotlight is shined on me, there will be a base to back it up. As yet, that spotlight has not yet shined on me, but I'm laboring on believing that at some point it will. I imagine that base is pretty important to get above the huge number of candidates in the race right now? Gary Johnson: If you take Florida last week, that's a good example. There are something like 210 candidates for President, and I don't know how many Republications, but maybe 40 to 50 Republicans. In Florida, last week they issued who was going to be on the primary ballot in Florida, and there were 9 candidates. I think for all intents and purposes, those are the 9 candidates who will be in the race, and I'm one of those candidates. What message are you trying to get out to voters which so far hasn't been getting out there through TV and other mediums? Gary Johnson: You can go down the list. I'm making three promises, three promises that, if elected President of the United States, are things I am going to do. I made very few promises running for Governor of New Mexico, but every promise I kept. The first is, I believe that we're on the verge of a monetary collapse in this country. By monetary collapse, I mean something like Russia. We will never recover from a monetary collapse in our lifetime. That's waking up one morning, and not having that dollar that you have in the bank worth anything, and having that happen in a very short amount of time. It happens very quickly, and I think we are not immune to that happening here. It's the mathematics of spending more than you are taking in. I'm promising to balance the federal budget--well, promising to submit a balanced budget, since it requires legislative action to pass--but I promise to submit a balanced budget, which means a 43 percent reduction in current government spending. No one is talking about that. What that does entail, is start talking about Medicare, Medicaid, and military spending, all of which need to be cut 43 percent. I maintain that if we don't do that, we'll find ourselves in monetary collapse, and we'll be left with nothing, nothing. That's promise number one, submitting a balanced budget. Number two, is I'd veto any expenditure that exceeds revenues. Congress can of course override any veto, but I will submit to you, that under that scenario, spending will be less than in any other scenario that you can come up with. Lastly, I am promising to advocate for the FAIRTAX, which is an effort to throw out the entire federal tax system. You can go to Fairtax.org (www.fairtax.org) to read up on it. If you're not well versed with that, it throws out the entire Federal tax system, income tax, business tax, corporate tax, throws out the IRS, does not withhold from a paycheck, and instead replaces that with a 23 percent consumption tax. That is revenue neutral, cuts government spending, and establishes a zero percent corporate income tax. If, in an environment of zero corporate income tax, private businesses can't create tens of millions of jobs, I don't know what would work. The other thing, is I am not a social conservative. Of the other eight candidates, if you look at me as number nine in the race based on the Florida primary list, is I'm the only one who is not a social conservative. I'm a classical liberal. I believe that the best government is the least government, and that the best thing the government can do for you and I is to empower you and I. If you Wikipedia classical liberal, I'm a classical liberal I genuinely believe in the free market. I'm not a tariff guy. If China wants to subsidize goods and send them to us, we ought to take advantage of that. It's ultimately to the detriment of China to do that. Tariffs, in my opinions, have lots of unintended consequences. Government has unintended consequences, and always does. I think we need to end the war on drugs, and legalize marijuana. In the context of immigration and immigration issues, I think the rot cause of border violence is prohibition of drugs. If you want to address border violence, legalizing marijuana goes three quarters of the way towards addressing the 40,000 deaths south of the border over the last three years. That is using guns, instead of courts. All of my other opponents talk about adding guns to that, rather than addressing the root of the problem. I think the difference I have with everybody on the stage, lie in the definition of a classical liberal, which is the notion that the best government really is the least government. If you look at which candidates have the resume to say they have pursued that more than any other, I think I have that resume, that the notion of the best government is the one that empowers you and I to make decisions. We don't want a government policing out bedroom activities, making criminal something because of their moral views. Our readers are heavily involved in technology, science, investor and business; what issues do you think are important for them, and what do you have to offer them? Gary Johson: Back when I was Governor of New Mexico, what I offered in big doses was the notion that what government should provide, and can provide is a level playing field. There shouldn't be any advantage to any group, to any company by dishing out payola for special favors or loopholes. That's the whole Occupy Wall Street thing. I think they are well founded in being upset and outraged over bailouts, and over the fact that corporations pay for this stuff. It's outrageous to me, and it should be to every American, that we are not all treated equally. I think that the FAIRTAX goes a whole long way to the notion of fair, that the name FAIRTAX implies. Government policy really needs to focus on equality for all, as opposed to doling out special favors. The root of all evil are politicians who say they are there to save us from the evil of the day, whether that's terrorism, illegal aliens, health care and health care costs, retirement, or the drug war. You name it, there is a politician who will stand up and say, contribute to me and elect me, and I will save you. Do you plan on more online outreach as your campaign goes on? 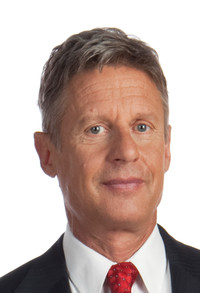 Gary Johnson: It's really a function of what is offered to me. I'm taking advantage of whatever is offered. We've been holding online Google meetups -- we've had about six of those in the last few months, which is really in line with what we're doing later this afternoon. Thanks, and good luck with your campaign! Editor's note: our interviews are not an endorsement of any particular candidate for office.